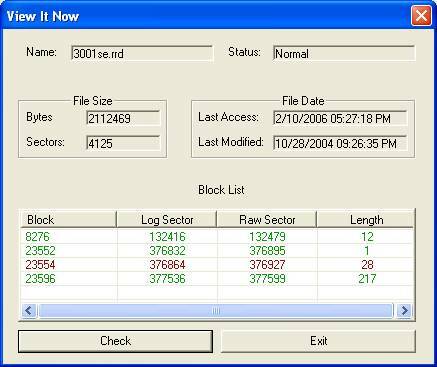 View It Now is a software tool that allows the technician to view a file system and its components. Another way of looking at it is that we are creating a virtual drive that allows the technician to view folders, files, and their attributes in order to help them and their client evaluate a problem and choose the best path for recovery. Like all tools this one is not the answer to every situation, however, coupled with other tools will aid the technician in diagnosing a corrupt file system and ultimately recover a client’s valuable files. This Quick-Start portion of the documentation is designed for a single drive, with no special offsets, no special file handlers, and no special tests. The technician just wants to view the file system of a drive that will not mount. The following are the steps to use to do that. The first step is to assign a stream to a stream list. Although you may have more than one stream in a stream set list this quick start outline assumes a single data stream in your stream set list. As with most software products you will see a menu bar just under the title bar of the main window. The first option on the menu bar is labeled ‘Configuration’. Click on that option. A drop down menu will appear with several more options in it. Click on the option ‘Populate Stream List’. Upon doing so all physical drives attached to the local computer should be displayed in the list box below with the header ‘Stream List’. Once the physical stream list has been populated with all the physical drives on the system the next step is to configure a stream set list. Since, for purpose of this quick start guide, we will only working with a single drive just move your mouse over the stream that you want to activate and double click. The drive will then be added to the list box to the right of the stream list which is labeled ‘Stream Set List’. The final step will be to take your mouse and move it over the button in the center left of the screen titled ‘Mount Stream Set’ and click on that. If you have done everything correctly a dialog box will appear indicating that your ‘Stream Set is mounted’. Now that we have our stream set mounted it is time to search for volumes within the stream set. This is simply done by moving your mouse over the ‘Volume Tools’ menu item and clicking on it. Another drop down menu will be presented to you with several options listed. We want to use the option ‘Search For File System Volumes’. Click on that option and the search will begin. You may monitor the progress of your search by viewing the ‘Search Information’ box and watching the ‘Block’ item in that box. As each block is tested the counter will increase until all blocks have been searched. Below the ‘Search Information’ box you will notice a list box which is labeled ‘Volume List’. If a volume is found during the search it will be listed in this list box. A complete drive search could take several hours. If, during a search you happen to see the volume you are looking listed for you may ‘interrupt’ the search process by moving your mouse over the ‘Configuration’ item on the menu bar and clicking it. You will be presented with a drop down menu which will have the item ‘Interrupt Processing’. Click on that and the search will terminate. In order for you to use the software tools on the volume you must mount it. Simply move the mouse over the volume which you want to mount and click on it. Then move your mouse over the button that is labeled ‘Mount Volume’ and click. You may also just double click on the volume you wish to mount instead of clicking on the mouse. If the volume is mounted successfully you will receive the messageVolume is mounted. This final step will allow you to view your data in an explorer like format. To recap, we have the physical drive mounted, a search has been done, a volume was discovered, and you have mounted that volume. Move your mouse over the main menu bar and click on the item ‘Volume Tools’. You will again be presented with a drop down menu with several selections. Move your mouse over the selection ‘Tree Active Volume’ and then click on it. If the file system has any active folders or files in it you should notice the ‘Folders’ and ‘Files’ counters in the ‘Search Information’ box increasing. The software is cataloging the file system. Once the file and folder search has completed there may be a several second pause while the software sorts the data. After the sort has completed you will be presented a folder tree in the center of the screen and a file list just to the right. There are many times when the technician will make an image of the drive and save it to a server, USB drive, etc. These images can be used in a stream set list but first, must be added to the stream list. Here is how that is accomplished. The menu bar has the option ‘Configuration’. After clicking on that option you will be presented with a drop-down menu that has several more options. Choose the item ‘Add File To Stream List’. You will be presented with a standard Microsoft Choose File dialog box. Find your file, or files and highlight it/them. Click on open and the file images you have chosen will be added to your stream list and can now be used for a stream set. A RAID zero has two or more streams, as well as a stripe size. These attributes can be configured in View It Now. The following is how you may do this. The following is a step by step explanation for configuring your RAID five. Add all the streams in your RAID Zero from the stream list making sure to keep the streams in the same order as your array. A RAID five has three of more streams as well as a stripe size, a parity shift indicator, and a block shift indicator. These attributes can be configured in View It Now. The following is a step by step explanation for configuring your RAID five. Add all of the streams in your RAID five from the stream list, making sure to keep the streams in the same order as your array. Choose a parity shift type from the appropriate combo box. Parity shift is the direction the parity block moves within the stripe. Sometimes it is ascending meaning from low stream number to high stream number, and conversely other times it is descending. Most arrays are descending. Choose a block shift type from the last combo box in the stripe configuration group box. Block Shift is the indicator used when the software calculates where the first block is a stripe begins. In other words, does block one of the stripe always start from the first stream, or does it start after the parity block. Most arrays use the first stream, or primary method. Once the array is configured you may continue to use the stream set as outlined in the quick start. The majority of the file systems start at sector zero of a stream. However, there are times when it is necessary to start a file system search or build from a point other than sector zero. In order to allow the technician the flexibility to set different starting points for a stream View It Now has the option to change a stream beginning offset. 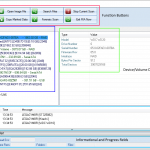 Find the group box ‘Configuration Data’. In the group will be an editable text field and two buttons. The following are the steps used to configure a custom offset for single or multiple streams. Enter into the editable text field the sector offset you would like to use. In the stream set list box activate the stream you want to update by clicking on it. Click on the button labeled ‘Set Single Stream Offset’. Check the stream you activated by looking in the ‘Start Offset’ column to make sure that the stream offset has been updated. Click on the button labeled ‘Set All Stream Offsets’. Check all streams by looking in the ‘Start Offset’ column to make sure that the stream offsets have been updated. There are some instances where a full search, or a full tree, or a full report is not necessary or may be too time consuming. So the technician can stop the processing anytime a menu item was put in the software aptly labeled ‘Interrupt Processing’. To use this function click on the menu bar item ‘Configuration’. You will be presented with a drop down menu. In that menu is the option labeled ‘Interrupt Processing’, just click on that and whatever is working in the software will stop. 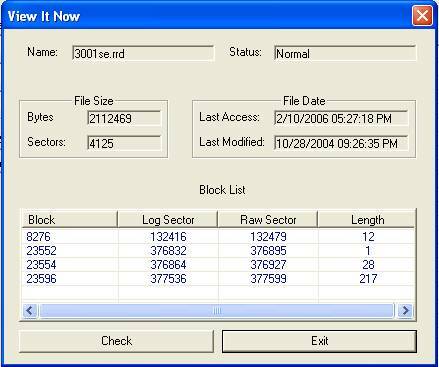 Finding a bad block in a file can be one of the most tedious jobs a technician will ever run across. This option will allow the tech a greater degree of flexibility as well as an ‘online’ look at the block list of any file. The majority of the data fields are self-explanatory, however I would like to direct your attention to the ‘Block List’ list box in the lower portion of the dialog box. There are four columns in the list box that need a brief explanation. Block: This is the logical start block number of this block list run. Raw Sector: This is the sector offset from the beginning of the stream. This number is zero based from the beginning of the stream. Blue: Indicates that the block run has not been checked for bad blocks. Red: Indicates the block run has been checked and some bad sectors have been found in the run. As you can see there are for block runs, and the third run has one or more bad sectors in it. View It Now uses the same bad block marker as the report ‘Export Corrupt File List To Text File’, so use the same software to generate the image that you used for that report. If you run the report then all of the blocks are marked as good or bad (Green/Red). However you do not need to run the report. If you want information on a single file just mouse over the ‘Check’ button and click on it. The software will run a test on all the block runs and display the results. View It Now has some reporting capability that will allow the technician a different perspective on the current file system. The reports can be used by clicking on the ’Reports’ item of the menu bar. Upon doing so you will be presented with a list of reports that can be generated. The following is a list of those reports. 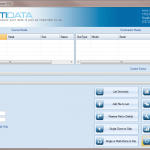 This report allows the technician to save the file system to a text file for viewing or printing. This lists all the files currently in the tree, as well as the folder the file resides. There are times when there are bad sectors on a hard drive that cause problems with operating system boot, application execution, database corruption and on and on. Many times these are just system areas on the drive that are corrupt, or files themselves that have developed bad sectors. This report will allow the technician to read all the related blocks of a file and determine if in fact there are corrupt files. In order to generate this report the following steps must be taken. Clone the source drive onto the destination drive using software that will not write anything to the destination drive if it runs into a bad sector on the destination drive. 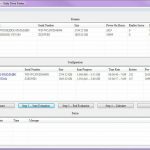 Use the View It Now software to tree up the file system using the source drive created by the wipe/clone sequence. ALL RECOVER IT NOW SERVICES ARE PROVIDED BY THE COMPANY DTIDATARECOVERY.COM,INC AND ITS TECHNICIANS “”AS IS”” AND ANY EXPRESS OR IMPLIED WARRANTIES, INCLUDING, BUT NOT LIMITED TO, THE IMPLIED WARRANTIES OF MERCHANT-ABILITY AND FITNESS FOR A PARTICULAR PURPOSE ARE DISCLAIMED. IN NO EVENT SHALL THE COMPANY OR CONTRIBUTORS BE LIABLE FOR ANY DIRECT, INDIRECT, INCIDENTAL, SPECIAL, EXEMPLARY, OR CONSEQUENTIAL DAMAGES (INCLUDING, BUT NOT LIMITED TO, PROCUREMENT OF SUBSTITUTE GOODS OR SERVICES; LOSS OF USE, DATA, OR PROFITS; OR BUSINESS INTERRUPTION) HOWEVER CAUSED AND ON ANY THEORY OF LIABILITY, WHETHER IN CONTRACT, STRICT LIABILITY, OR TORT (INCLUDING NEGLIGENCE OR OTHERWISE) ARISING IN ANY WAY OUT OF THE USE OF THIS SERVICE, EVEN IF ADVISED OF THE POSSIBILITY OF SUCH DAMAGE.